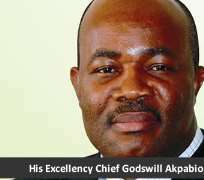 Akwa Ibom Governor, Chief Godswill Akpabio has called for prevalence of justice to allow the emergence of his successor from Eket Senatorial District in the state during the 2015 general elections. Chief Akpabio, who made the call Sunday during the state Inter-Religious Service of the 26th anniversary creation of the state held at the Ibom Hall Grounds, Uyo, urged the people to shun monetary considerations to allow the will of God to prevail to enhance the unity and harmony in the state. Akpabio remarked “The choice of the next Governor would be the choice of the people. The will of God for the people in 2015 is peace and justice, for living in peace has to do with justice. In the cause of the next elections, come 2015, the youths of the state must shun social vices like kidnapping, drug addiction and other negative vices to attract the favour of God and no monetary considerations should bring disunity and disharmony to the state. The youths must not be negatively influenced with money to take wrong decisions towards 2015 governorship bid”. The Governor, who took the scripture reading from Isaiah 60:1-6, pointed out that the the service was to celebrate the state at 26 and to thank God for the great things He has done for the state throughout his administration. In his homily, the Primate of The African church, Most Rev. Emmanuel Josiah Udofia, who spoke on the theme,”Season of His Glory”, said that God is the reason for the season of glory in the state and that the gathering of all Akwa Ibom people in the service was to thank God for what he has done for the state. He acknowledged that what God has done for the state was both spiritual and physical, in that the state has taken a rival stand to tell the world that God has done it for the state, who has made Akwa Ibom state to be qualified on what other people in other countries are enjoying, stressing that the state has been delivered by God who had given a promising son through Governor Akpabio. Most Rev. Udofia who further thanked God for the Governor, who had always partnered the church, stressed that his partnership with the church has brought success to the state and that God had brought honor to the state, where the state has now become a reference point and is now recognized within and outside the country. The Primate called on politicians not to employ character assassination, kidnapping and other negative vices during the 2015 elections but to play fair play and peace and also call on the federal government and executives of ASUU to consider the future of the youths to resolve the issue of strike for Nigerian youths to go back to school. The state Chairman, Christian Association of Nigeria (CAN), Bishop Cletus Bassey, thanked Governor Akpabio for approving the organization of the thanksgiving service on a yearly basis, saying that the entire people in the state must look into the future with one mind, disregarding tribalism in order to build a brighter future for the state. Bishop Bassey further said the church must remain neutral to hear the voice of God clearly and that leaders must sit together to discuss on what would unite and not disunite the country, urging politicians to learn to trust each other by not using the youths negatively for the 2015 general elections.